As the years go by, wrinkles and fine lines can become more noticeable. Anti-aging treatments can help rejuvenate your skin tone and features and restore a natural, youthful appearance. Injectable treatments such as Botox, Dysport and dermal fillers can help both men and women look and feel their best, without surgery. Injectable cosmetics are designed to make your skin appear younger and smoother, as well as provide new contours to facial features by plumping up the lips and adding volume to areas of the face. Botox - is an FDA-approved treatment to temporarily improve the appearance of lines on the forehead, crow’s feet around the eyes, and frown lines in the brow area. 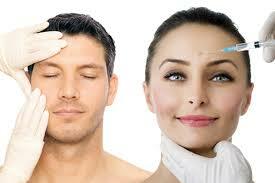 Botox is injected into the facial muscles to relax for a naturally refreshed look. Dysport - Like its counterpart Botox, Dysport is also used to temporarily reduce the appearance of fine lines and wrinkles, lift your brow and smooth and tighten your skin. The results are a more youthful, refreshed look while still allowing for facial expressions. Restylane - Decreased levels of collagen, elastin and hyaluronic acid can make your skin look less smooth and plump. Restylane, is a safe and gentle cosmetic dermal filler that works together with your body’s own hyaluronic acid to lift and smooth your skin and soften lines and wrinkles. Juvederm - is another dermal filler option. Each product in the Juvederm collection of fillers adds volume to a different area of the face to lift cheeks, smooth parentheses lines, or plump the lips. The results are natural looking and long lasting.